Time to get your “Holiday Event” on in Aelion as Skyforge kicks of a number of events for players. Just logging in allows players to pay the Holiday Tree a visit and obtain a free gift. Sign in each day and you may take 1 gift from under the tree netting you up to a total of 14 gifts should you log in each day between now and when the events end on January 3rd. Gifts culminate in the awarding of a legendary carrot relic. 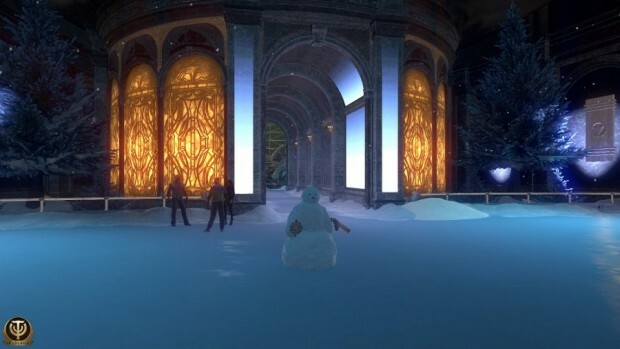 If you’re looking for a more interactive event, and ones that reward players a bit more, then you may want to start saving up snowballs as there will be daily quests in the park (which reward currency) involving throwing snowballs at Khelp Pranksters. Pranksters also have a chance of spawning at the completion of certain 3 to 5 player battles. Only snowballs and Divine forms will be of any use in trying to damage these loot stealing menaces. Having a Khelp Talisman on you though could help you avoid their thievery but dealing with them could also net you some in-game currency. Adepts get additional snowballs on their journey. Feed the snowballs with snow and you can obtain a Snowman. Sound odd and vague? Maybe a little. Why? Well, check out the official post, it’s a bit difficult to interpret.